Order your own copy of Beneath the Red Keep at your local retailer or online through our website today! 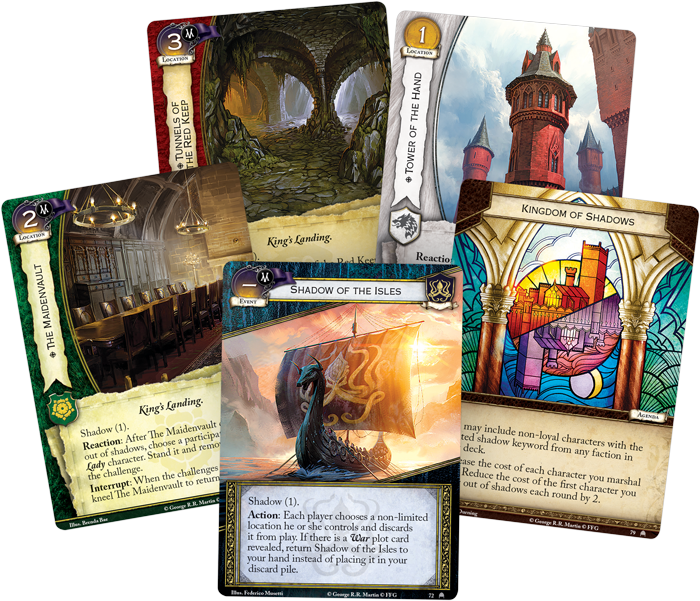 Step out of the pages of A Song of Ice and Fire and into the world of Westeros in the King’s Landing cycle for A Game of Thrones: The Card Game! With the sixth cycle of this Living Card Game®, you take on a new direction as the focus shifts from the plot of George R.R. Martin’s saga to the locations that host the greatest heroes and most vile villains in the Seven Kingdoms. One of the key locations of the capital is the Red Keep, which stands atop Aegon’s Hill in the heart of the city. Seeing enemies everywhere, King Maegor I Targaryen had the Red Keep built as the ultimate fortress. When its construction was completed, Maegor had all who worked on the castle put to death to protect its secrets. 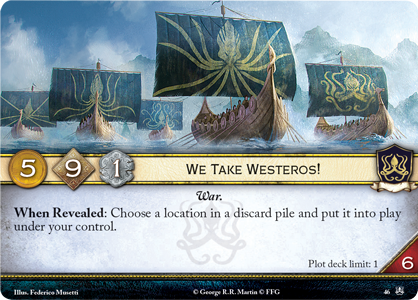 Over the centuries, people have uncovered much of what Maegor sought to keep safe, and now, these secrets are laid before you to use as you will in your battles for the Iron Throne. 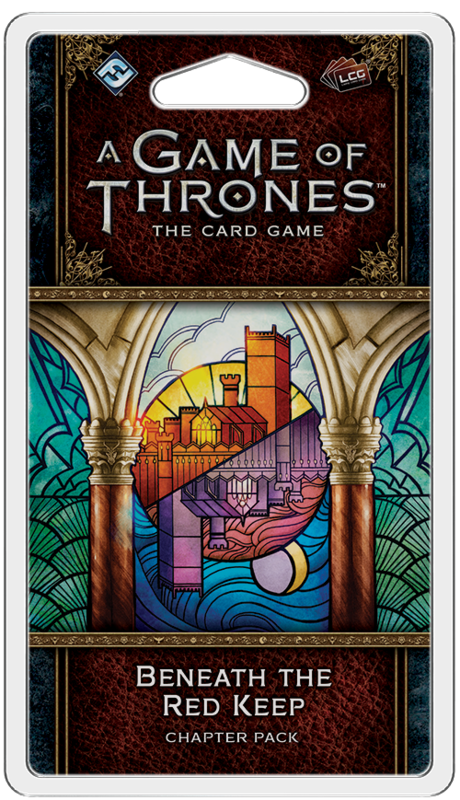 Fantasy Flight Games is proud to announce Beneath the Red Keep, the fourth Chapter Pack in the King’s Landing cycle for A Game of Thrones: The Card Game—now available for pre-order at your local retailer or online through our website! 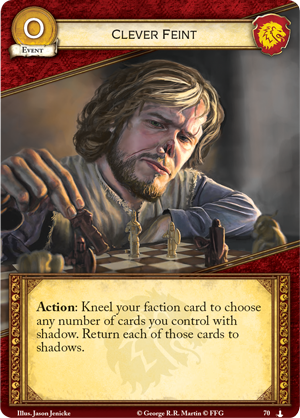 The King’s Landing cycle adds a new layer of tension and uncertainty to your battles for the throne with the continued development of the shadow keyword, first reintroduced in the fifth cycle of A Game of Thrones: The Card Game. 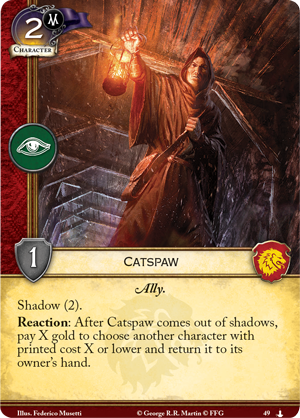 For just two gold, you can hide away your most cunning cards in shadows, where they are safe from reserve restrictions and intrigue claim until the moment comes to close your trap. 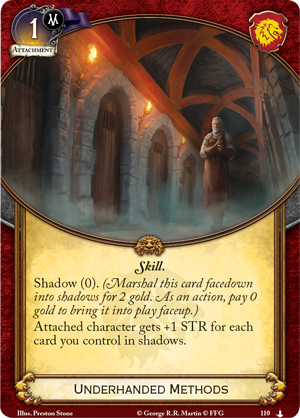 Beneath the Red Keep gives you the chance to focus your deck around the shadow keyword with unparalleled flexibility with the new agenda, Kingdom of Shadows (Beneath the Red Keep, 79). 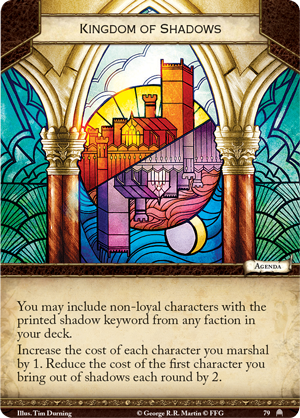 As characters from across the world gather in buzzing metropolis of King’s Landing, Kingdom of Shadows lets you include non-loyal characters from any faction in your deck, as long as they bear the shadow keyword. You are free to forge alliances with any schemer who will further your plans, creating synergy between multiple Houses and covering any weaknesses. This agenda further incentivizes you to make the most of the shadows by increasing the cost of each character you marshal by one. 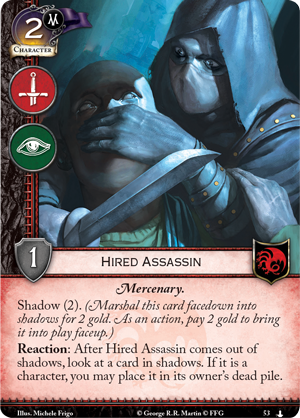 However, cards brought out of shadows escape this tax, and Kingdom of Shadows further reduces the cost of the first character you bring out of shadows each round by two. 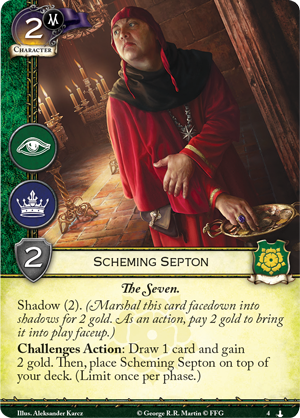 This means you can include a Scheming Septon (The Shadow City, 4), Catspaw (Streets of King’s Landing, 49), and a Hired Assassin (Streets of King’s Landing, 53) all in one deck, with the chance to bring them out of shadows for free! 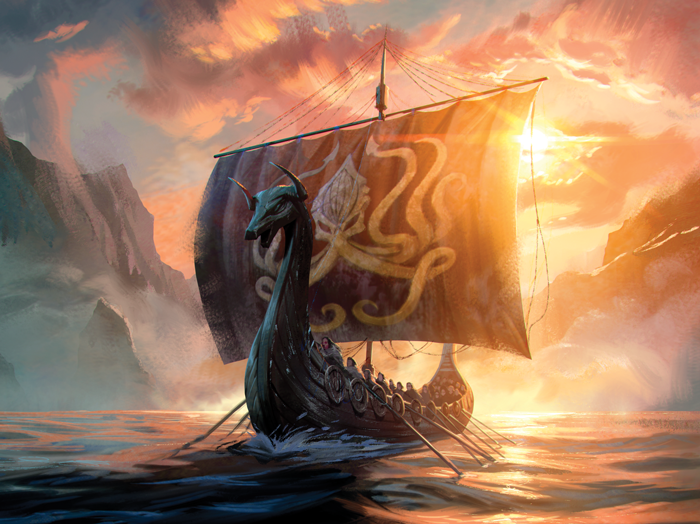 Beyond the city’s walls, threats stir upon the waves as House Greyjoy prepares to move for power with Shadow of the Isles (Beneath the Red Keep, 72). 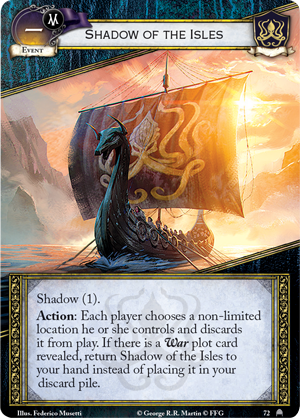 Like other loyal shadows events that appeared earlier in the cycle in City of Secrets, Shadow of the Isles can only be brought into play from shadows, but once you reveal the event, you can raze the mainland, having each player chooses a non-limited location and discard it from play. Then, if you honor the Drowned God by having a War plot like We Take Westeros! 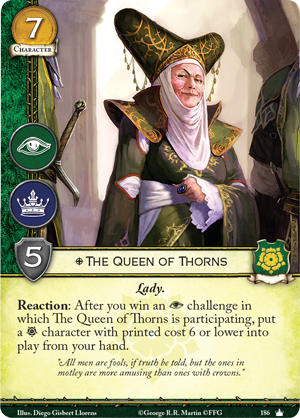 (Kings of the Isles, 46) revealed, you can return this event to your hand instead of discarding it, ready to launch another raid before your opponent can rebuild. This Chapter Pack also gives you the chance to explore every corner of the Red Keep with new King’s Landing locations that take you from the tallest rampart to the deepest dungeon of Maegor’s architectural wonder. 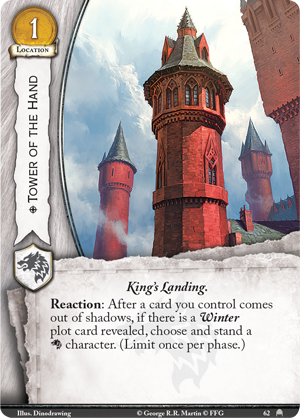 The Tower of the Hand (Beneath the Red Keep, 62) that housed Eddard Stark when he first took his position as Hand of the King grants the Starks a chance to prepare for unexpected schemes, standing a Stark character if you have a Winter plot after a card you control comes out of shadows. 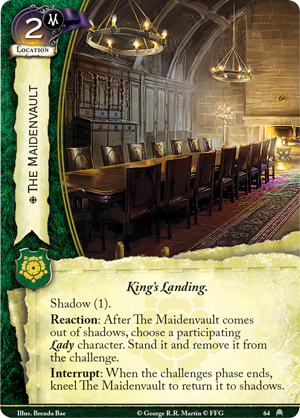 Meanwhile, The Maidenvault (Beneath the Red Keep, 64) aids House Tyrell with responding to any surprises that may arise during a challenge by allowing a Lady to stand and leave a challenge once the location is sprung from the shadows. 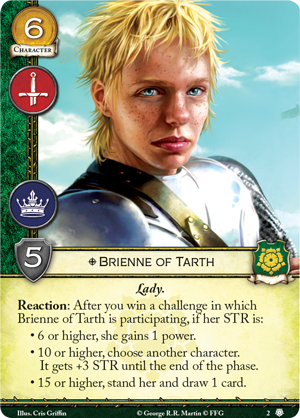 For just one gold, you can save a key high-cost character like The Queen of Thorns (Core Set, 186) or the invaluable Brienne of Tarth (House of Thorns, 2) from overcommiting to a challenge, or push your opponent's Lady character out of the challenge. And, like Shadow of the Isles, you can use this card again and again by returning it to shadows at the end of the challenge phase. Lastly, House Lannister, whose golden heirs have resided in the Red Keep alongside Robert Baratheon for many years, can delve deep into the shadows of the Tunnels of the Red Keep (Beneath the Red Keep, 70). This location may also be returned to the shadows by kneeling it, and if you do so, then each character you control gets increased STR for each of your cards in shadows! While they are guaranteed to gain at least one STR for the tunnels themselves, you can compound this ability with Clever Feint (Music of Dragons, 70) and Underhanded Methods (Daggers in the Dark, 110) to turn your army into an unstoppable force. Maegor designed his castle to be an impregnable fortress that nothing but dragonfire could topple, but will you be able to survive the threats that dwell within? The Red Keep holds secrets once known to only spiders and the dead, but as the world darkens in the King’s Landing cycle, such secrets always come to light. Turn the fortress into your stronghold and discover the secrets that wait to be found Beneath the Red Keep! 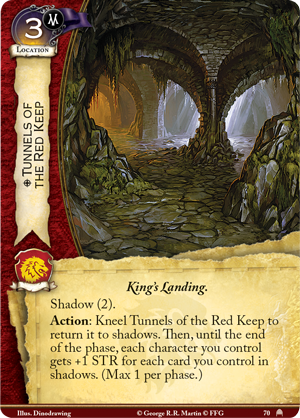 Look for Beneath the Red Keep (GT49) when it hits shelves in the third quarter of 2019! You can pre-order your copy of this Chapter Pack at your local retailer today or online through the Fantasy Flight Games website here!